The Social Welfare Council awarded CFC with the highly prestigious Tulasi Mehar Social Service Award for 1996 in recognition of our long and dedicated service to the underprivileged and to the needy. Tulasi Mehar was a towering social worker and a disciple of Mahatma Gandhi. The Social Welfare Council had established the award in his honour. It is awarded every year on occasion of the Social Service Day of Nepal (On Nepali date 6th Ashoj every year). Institutions and individuals doing exemplary work are honoured on the day. 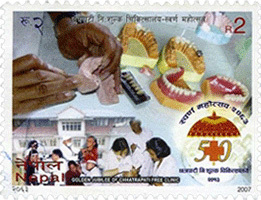 The Government of Nepal also honoured and celebrated the achievements of the clinic by issuing a special postage stamp commemorating the Clinic’s Golden Jubilee on February 6, 2007 . In 2002 and 2003 CFC was also honoured for our oral health awareness campaigns in school with the outstanding Nominee Award for Oral Health Awareness Award set up by the Ministry of Health, Government of Nepal.